We’ve been flying lots of low cost airlines around Europe, and there are a lot of them out there. Most are “no frill”, some are about as comfortable as a municipal bus, but the flights are never more than 90 minutes long. I’ve found most of them through a low cost flight search engine at www.bravofly.com. It amazing how inexpensive it can be if you book your tickets far enough in advance. Some of these fares were less than $15 each (before taxes), however the tax can sometimes end up being twice the cost of the fare. The cabin of the Air Baltic flight from Warsaw to Vilnius smelled like a goat stall, but for 80 minutes, we just fluffed up the straw and made ourselves comfortable. The twin propeller Fokker 50 had a capacity of 40, but there were barely 25 of us, including a Scotsman in a kilt. All was well till we got to the airport. One of our bags was missing. The Air Baltic office only deals with tickets. For problems with baggage, we were directed to the Litcargus office (Lithuanian Cargo). All the baggage in and out of Vilnius is subcontracted to Litcargus. Not a bad idea in theory. They took the information and said they’d call when the bag showed up and we went off to our hotel, thinking the bag would probably come the next day. No big problem. But then we underestimated the incompetence of an inept, bureaucratic, post Soviet country. We arrived to Vilnius on September 3rd, the third day of the annual “Capital Days” festival, the city’s largest festival. We missed Elton John Concert in the Vingis Park, but the concert of Lithuanian pop stars was in full tilt in the Cathedral Square a few minutes from our Hotel. The band, Saules Kliosas, was just starting. This was a major event; stage, lighting and audio systems, video cameras, sky booms, satellite truck, police, barricades and thousands of young Lithuanians holding hands and circle dancing. I think we were the oldest people in the crowd. But after a couple of numbers by Saules Kliosas, a straight ahead pop rock band with a Bjork-like singer, we took off in search of dinner. Vilnius has a great music culture. It’s also the first bust of Frank Zappa ever installed as a piece of city art, even though Zappa never visited the city or had anything to do with Lithuania. 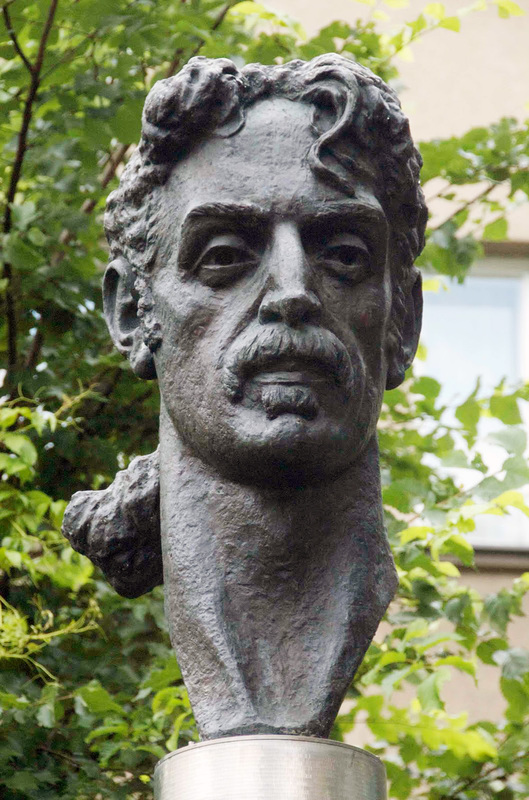 Zappa’s roots are Sicilian, but that didn’t disuade Saulius Paukstys, a local photographer and President of the Vilnius Frank Zappa fan club who successfully petitioned the government to let them install the statue outside of the Vilnius Art Academy. Hey, as long as the government didn’t have to pay for it, what did they care? Actually, the teachers at the Art academy cared enough to have the location moved. The bust, installed in 1995, sits on top of a 16′ stainless steel column at #1 Kalinausko Street in the city center. It was created by local sculptor Konstantinas Bogdanas, who’s previous work in the city was limited to busts of Lenin and other communists during the Soviet era. Gediminas Street is the main shopping artery through the city. Gediminas was the Grand Duke of Lithuania from 1315-1341 and founder of the city of Vilnius. The street named after him starts at the Cathedral Square and ends up at the KGB prison. In between are upscale fashions, theaters, hotels and fancy restaurants. It was hard to tell if the lights strung across the street were for the Capital Days festival or if the Christmas décor was just kept up year round. Crafts carts and food tents extended down both sides of the street, but by the time we got there they had all started to close up for the night. But ‘glory be” a sausage wagon was still open for business. Not just sausages and fired cabbage but “meat on a stick” too. I’m a big proponent for more meat on a stick choices, but these sticks had been to close to the fire for much too long. Our shoes might have been tastier. We got back to the Cathedral Square in time to catch the members of the band “Inculton” hoping around the stage like an 80’s punk band. The song they were playing was a mixture of rap, R&B, heavy metal and high octane traditional Polish. Gretchen referred to it the “itsy bitsy spider” polka. 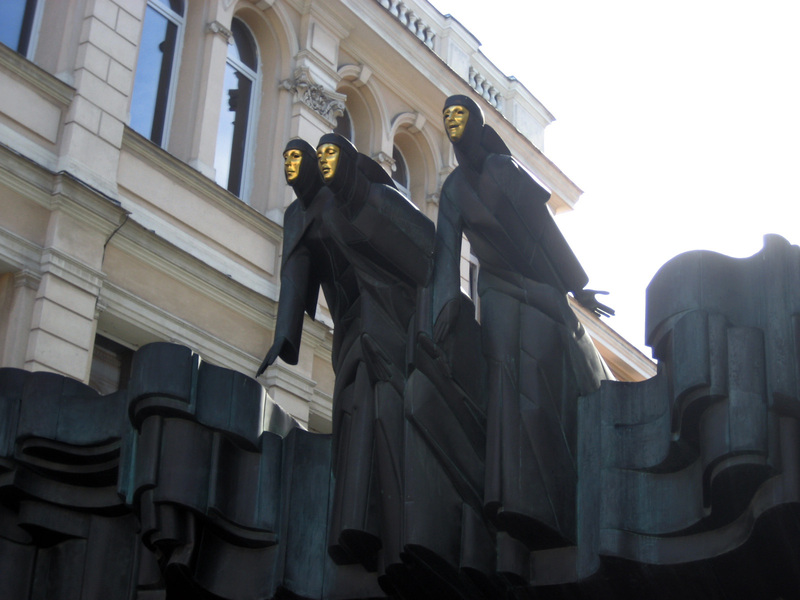 One of the first things I noticed about Vilnius is that everyone is tall with blond hair and blue eyes. They look nothing like me. I’m only mentioning this because my father’s family immigrated to the US from a small shtetle somewhere in Kovno Gubernyia, near the city of Kovno (now Kaunas), less than 50 km from Vilnius The only other mention I’ve ever heard of Kovno Gubernyia is from Leonard Bernstein’s “Candide”. One of the reasons we’ve come here is to find more about my ancestors. My grandfather rarely spoke about his past or his relations. According to my father, “he always said when you look for relatives, it always costs you money.” From the moment he came to America, sometime around 1890, he never looked back. There were no romantic stories of life on the farm with the family, Mom’s home cooked kugle or fishing in the small stream that ran by the house. It was as if life before America never existed. I was always sure there was an interesting story here, something buried deep in a closet. And now, here we were, a mere 50 km or less from the source. My family name is not a common one, but over the years, I’ve run into quite a few Romes, all of them with roots in Lithuania. And all of the Romes I’ve been in touch with are descended from the Romm family of Vilnius. The Brothers and Widow Romm Publishing house was one of the most famous publishing houses in 18th and 19th century Eastern Europe when Vilnius was known as the “Jerusalem of Lithuania”. Since my own relations were unable to provide enough background to my family tree, I made the leap of faith and added a branch to the Romm family. Hey, how many Romes can there be in this small country? The Choral Synagogue was closed up and the gate was locked so we stood across the street and took a few photos of the exterior. I don’t know if it was just serendipity or if the caretaker was looking at us through the window, but within moments, he was hobbling down the front steps, waving to us and ushering us inside, like a scene from an old Mel Brooks movie. The caretaker communicated to us through pictures, writing phantom numbers on a piece of cloth with his fingers and speaking in German. Even though we didn’t speak the language, it was an all too familiar story. Before the war there were over 100,000 Jews in Vilnius, 45% of the city’s population. After the war, 5,000. 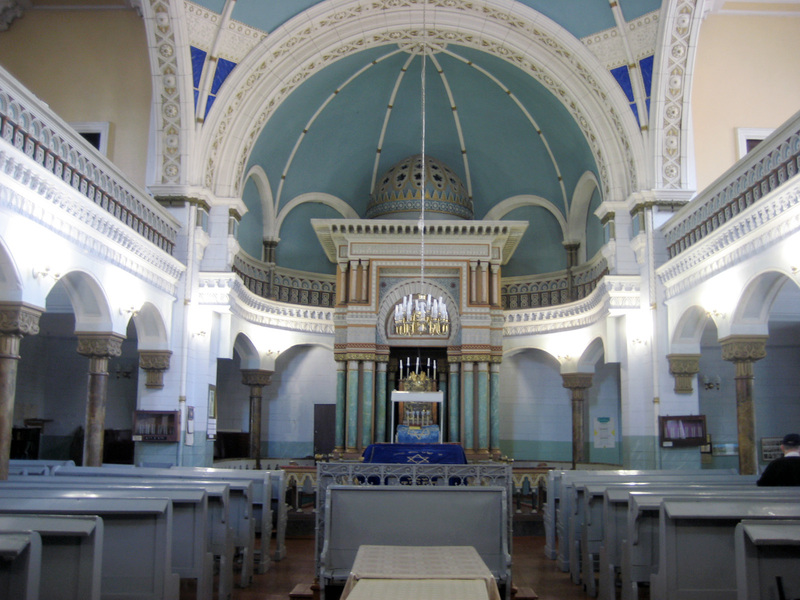 He told us although the Choral Synagogue (the only synagogue in the city to use a choir) was beautiful, it couldn’t compare to the Great Synagogue. Napoleon was quoted to have said the Great Synagogue rivaled the beauty of the Notre Dame in Paris. Marc Chagall captured it’s ornate interior in one of his earlier pieces. It was the pride of the Lithuanian Jewish Community, which was probably why it was destroyed by the Nazis. Looking into the horror of the Nazi holocaust alway brings a lot od sadness. The prisoners of the ghettos of Vilnius and Kovno knew their fate as soon as the Nazis arrived, realizing very quickly that they were in holding cells until the orders were given to terminate their lives. The Partisan and Ghetto resistance armies held off the inevitability for a while, but in the end, over 200,000 Jews were taken into the woods, shot and dumped into mass graves. We did find one uplifting story. Chiune “Sempo” Sugihara, the Japanese diplomat to Lithuania and his wife Yukiko , who for 29 days between July 31 and August 28, 1940, issued close to 6,000 letters of transit to Jews held captive in the Kovno ghetto. Years after the war he was asked why he did it. He replied “they simply needed help”. Galina Baranova is a large woman with a big smile, welcoming hand and a voice that sounds like Natasha Dahlink. She is the end of the road for all the people looking to find their Litvak ancestors. We had great hopes, actually expecting to see old records, birth certificates, books produced by the Romm publishing house and stacks of old photos of people who looked just like me. But, as it turned out, Rome was a more common name in Lithuania than I ever expected; Rome, Romm , Rom, Romov. Romovy. Galina pulled out three long file cabinet boxes of Romes from different shetels in Kovno Gubernya but none of them matched. It was a worthwhile visit, but without the town of birth, date and port of departure, siblings, or any other documents, I was right back to where I was before I left. 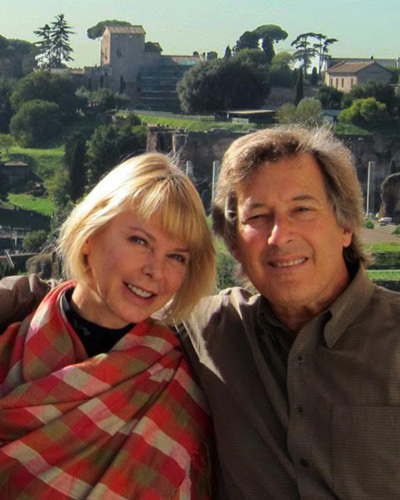 When we’re in Italy, the Italiani always say to me, “I know your family is from Italy, right?” I always smile and agree. Maybe they’re right. Maybe my family fled from Rome during the 15th century and settled in the Baltic where the political climate was better. There’s an old joke amonst Jews that many of them are named after cities they were thrown out of; Paris, London, Rome, etc. It’s also possible that my family has root going back even further when the Baltic Tribes had trade relations with the Roman Empire. We made a couple of visits to the other Jewish Museums, there are three of them in the city, but for the most part, the family search was over for now. Time to explore the rest of Vilnius. The old town covers 3.6 square kilometers. It’s an enormous array of gothic, renaissance and baroque. The center, by the Cathedral Square has been totally restored. But if you venture about 15 minutes away from the restoration you can still see a lot of the run down baroque buildings in waiting. Tourism is a major industry and provides lots of Lita (the Lithuanian currentcy) to the country, so we’re sure the tourist old town will grow exponentially in the next few years. 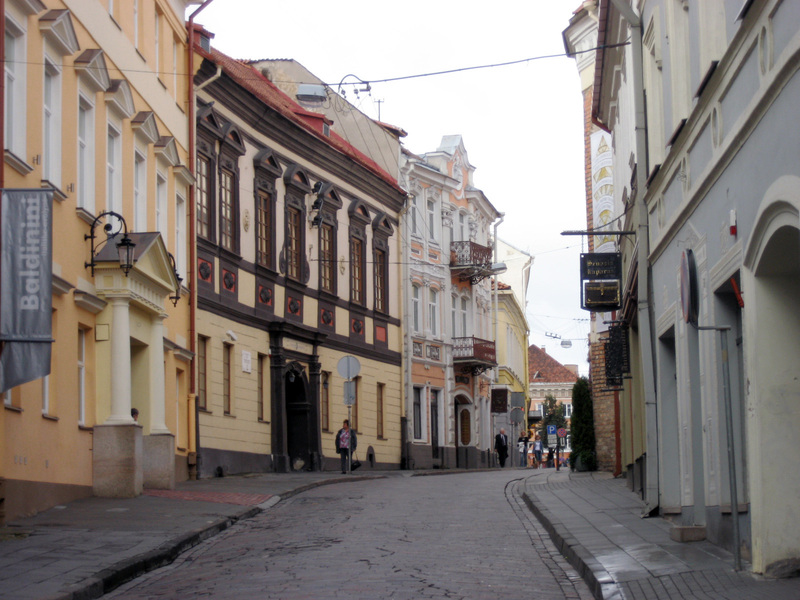 In many ways, Vilnius looks like Prague but with fewer tourists. Not only did we come during “Capital Days”, the Polish and Lithuanian Presidents were having a diplomatic “whooptidoo” complete with the pomp and circumstance of military marching bands from both countries. There were security guards, police, journalists and diplomatic “yes men” everywhere. But wait, there’s more. 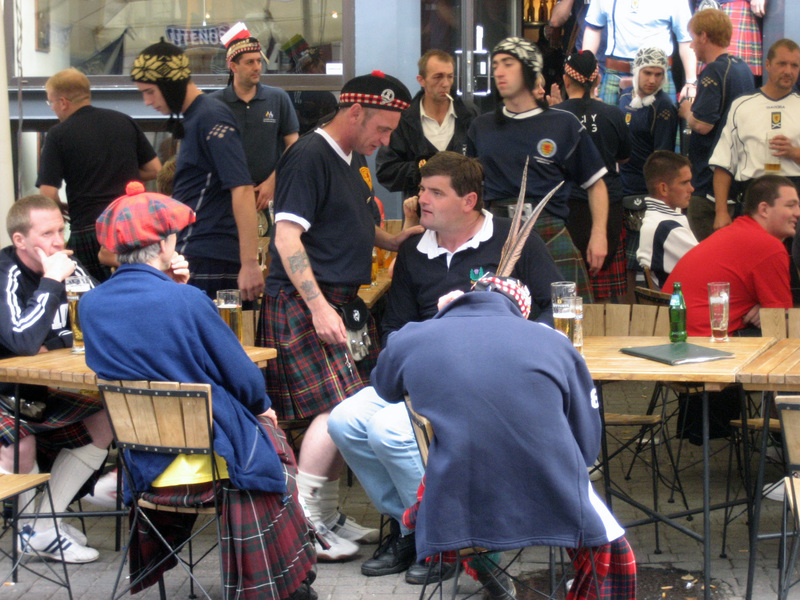 5,000 crazed Scotsmen in kilts have also invaded the city. We thought the one on our flight from Warsaw was strange, but you haven’t really seen strange till you’ve seen 5,000 of them. They’re here to cheer on their football team in the qualifying match against Lithuania for the Euro Cup. They’re everywhere, taking up the seats in every bar and pub in the city; from the moment they open till after closing time. They’re wearing flags on their backs and hanging banners on every bar they claim as their own. 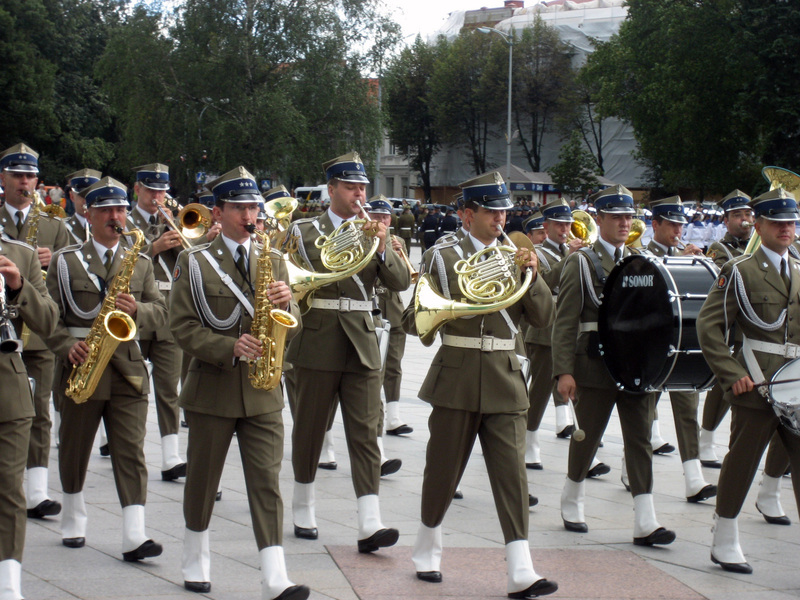 They’re trading hats with the Polish marching band. They’re cat calling and whistling at the absolutely beautiful Lithuanian women. We’re amazed the country has enough beer to feed them. By the way, Scotland did win the match 2-1. 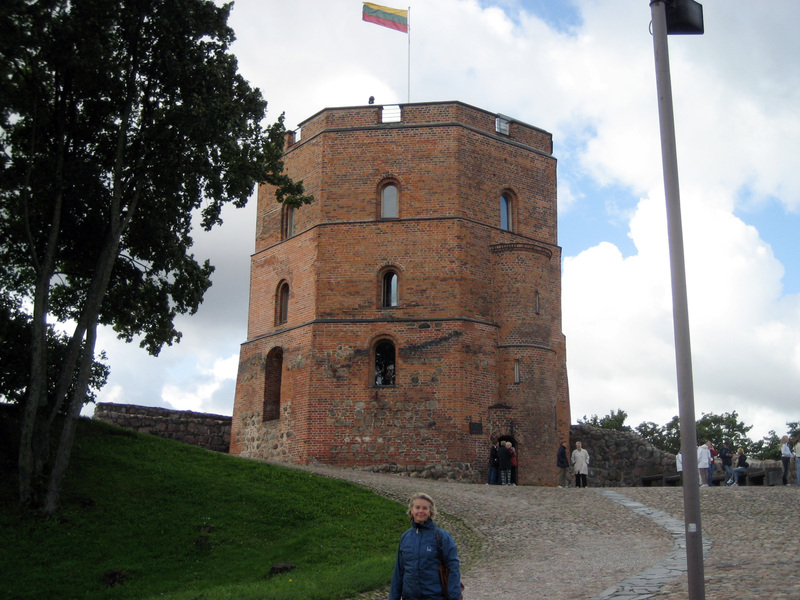 We take the finicular to the Gediminas Tower of the Upper Castle fortress. It’s an amazing view of the city. One side shows off the old red tile roofs, the other side the new modern city built up along the Vilnia river. We’re told that the Vilnius Basilisk, a snakelike creature that can turn humans into stone with one look, still lives in his lair under the Artillery bastion next to the tower. The bastion has come a long way from the days of the basilisk though. It was turned into an orphange, a dump and a storage shed for vegetables and now the armory of old weapons. We stroll through the Historical museum with reproductions of 18th and 19th century country homes and an old sleigh that looks like a giant bedroom slipper. 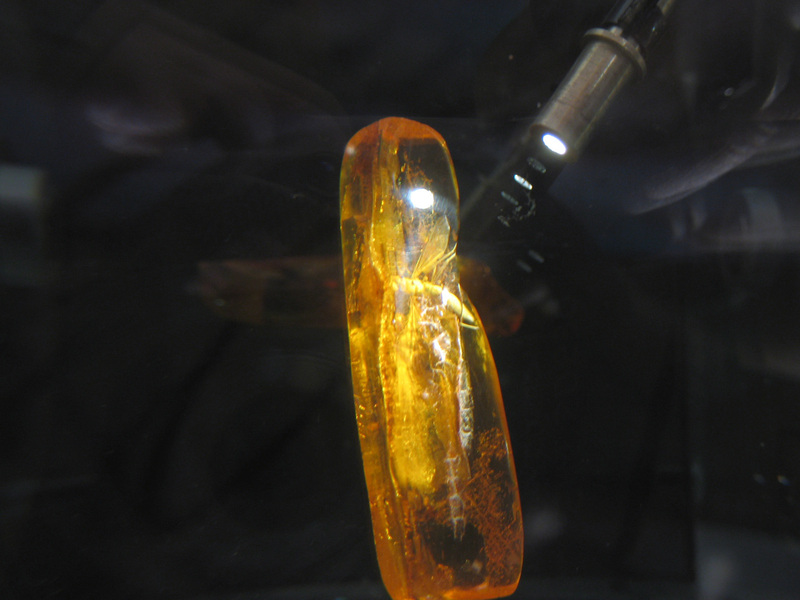 We made a few visits to a few churches and visit the Amber (fossilized tree resin) museum; most of the world’s amber is harvested off the ocean floor near the Baltic States, the North sea and parts of Russia. A couple of the pieces on display show prehistoric wasps buried inside. We shop for trinkets and silly folk toys. We eat stuffed cabbage, sausages, potato pancakes, borscht, blintzes, pierogies and the national dish, Cepelinai, a meat filled pocket made of boiled, grated potatoes, also referred to as a zeppelin, either because of it’s shape or the way it hits your belly. On our last day we walked down to the end of Gediminas Street to the KGB prison, now called the Museum of Genocide Victims. All of a sudden we’re back into the horrors of war. It’s a depressing stroll down Repression Boulevard from 1940-1991. Just when they thought the Nazi torture was over, in come Stalin’s Soviets. It’s hard to tell which was worse. Over 1,000 people were killed in the KGB prison in Vilnius. 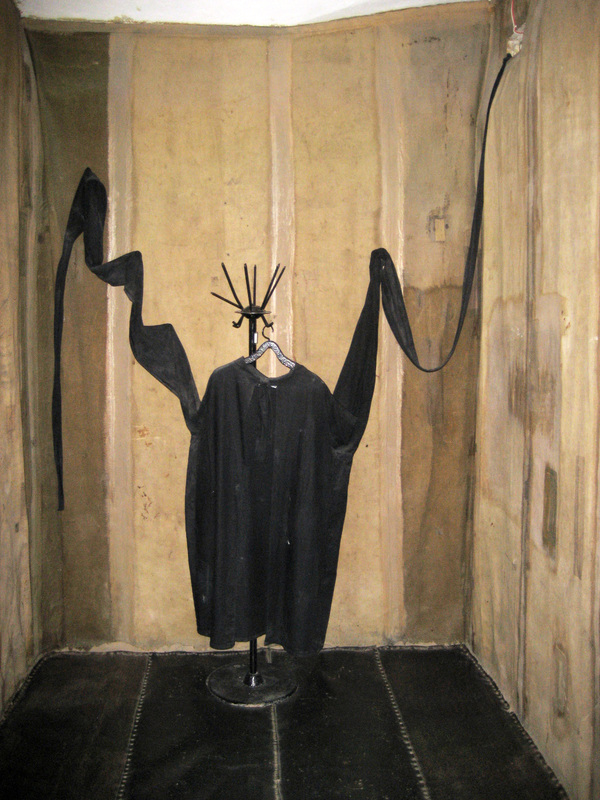 The prison has been restored to it’s former horror. The ground floor has a basic history of the Soviet repression with lots of personal items and death statistics. The second floor has the spying rooms (all the cells were bugged) and the basement is filled with about (50) prison cells, (2) solitary confinement cells, (1) ice water torture cell, (1) padded cell and the execution chamber. During the 1st Soviet occupation of Lithuania from 1940-41, over 3,000 Lithuanians were killed. When the Soviets returned in 1944, Lithuania had built up a Partisan army of 30,000 strong. But they were freedom fighters, students, villagers, women and children with no training and limited weapons. They didn’t have much of a chance against the Soviet military. The Partisan Wars against the Soviets went on from 1945 till 1965. Over 50,000 people fought on the side of the partisans. By the end of 1953, over 20,000 were killed. And after three days in Vilnius, and countless phone calls to both Litcargus and Air Baltic, our bag never turned up. We have to wait 21 days before they’ll discuss any reimbursement. We think they might give us something but we’re afraid it’ll be in Lita. November 10th (a little over 3 months after our bag was lost) at around 8pm we got a phone call from Lufthansa telling us they were on the way to deliver a bag to us. We never heard back from Air Baltic or Litcargus and we figured the bag and all contents were gone. One of the lost objects was an amber and silver letter opener Gretchen bought me as a birthday gift for me when we were in Warsaw. At 8:45pm, the bag arrived. My birthday was the following day, November 11th. Pretty good timing.